Eerie footage from NASA’s InSight spacecraft on Mars has caught “unworldly” sounds on the planet. The sound of wind moving over the lander can be heard in a video, where data has been raised by two octaves to make it more audible. 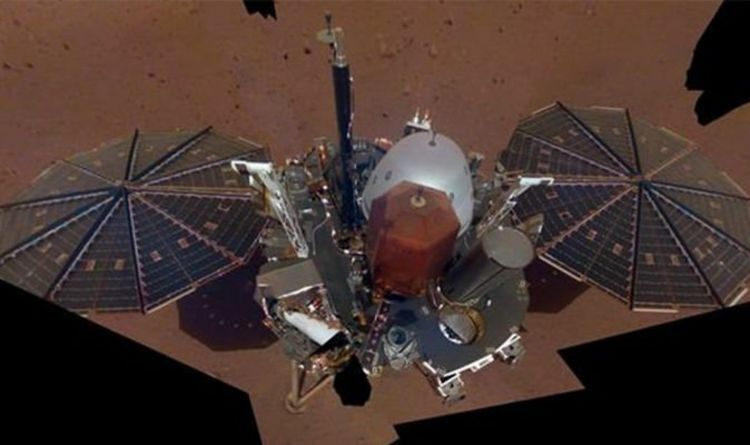 The data was captured by the spacecraft’s sensors and a seismometer, rather than a microphone, as the wind caused vibrations to move over the lander’s solar panels. It is the first ever time the sound has been recorded on Mars, according to NASA, and can be heard as a deep yet “unworldly” rumble. Bruce Banerdt, a NASA investigator of the InSight mission, said: “Capturing this audio was an unplanned treat. "But one of the things our mission is dedicated to is measuring motion on Mars, and naturally that includes motion caused by sound waves. "To me, the sounds are really unworldly. They do sound like the wind or maybe the ocean kind of roaring in the background. Tom Pike, InSight science team member and sensor designer at Imperial College London, explained: “The InSight lander acts like a giant ear. "The solar panels on the lander's sides respond to pressure fluctuations of the wind. It's like InSight is cupping its ears and hearing the Mars wind beating on it. “When we looked at the direction of the lander vibrations coming from the solar panels, it matches the expected wind direction at our landing site." NASA’S InSight Lander recently took its first SELFIE on Mars, showing Earth its “workspace” on the Red Planet. The almost sci-fi image was beamed back from Mars to Earth and shows the robot in position on the dusty terrain. NASA said in a tweet alongside the photo: “Say Cheese! InSight's first selfie on Mars reveals the lander's solar panels and deck! A second instrument, furnished by Germany's space agency, consists of a drill to burrow as much as 16feet underground, pulling behind it a rope-like thermal probe to measure heat flowing from inside the planet.